Sam grew up in Long Branch. He was small and had problems with his vision, but he was quick and powerful. This served him well in the pickup games he played with his brother’s older friends. It also made him a superb wrestler. After enrolling at Long Branch High School, Sam won the district wrestling championship twice. Sam was the star of the coach Sam Glazier’s Green Wave football team. After graduation, Sam continued his football career as a walk-on at Montclair State College in 1977. He played four years for coach Fred Hill’s Red Hawks, amassing over 500 tackles and setting single-season (142) and single-game (22) records. Sam was recognized as First Team All-NJ Athletic Conference three times and was Defensive Player of the Year as a sophomore, junior and senior. Sam believed he could be an effective player in the pros, but once again his size worked against him. NFL scouts loved the way he dominated the field, but were turned off once they heard he was just 5'9". Sam finagled a tryout with the Cleveland Browns and the CFL Toronto Argonauts, but he failed to impress. Sam taught at East Orange High School and helped coach the football team in 1981 and 1982. In 1983, he gave football one last shot when the United States Football League was formed. He made the roster of the Philadelphia Stars and quickly became their leader both on and off the field. Sam’s size and quickness earned him the nickname The Field Mouse. His biggest fan was coach Jim Mora. The Stars went 15–3 in their first season and reached the USFL championship game with a stunning comeback against the Chicago Blitz. The Stars were defeated by the Michigan Panthers in the title game, 24–22. The Stars went 16–2 in 1984 and won the USFL championship, beating Arizona 23–3. Sam was honored as a First-Team All-USFL linebacker both seasons. Sam was voted All-USFL again in 1985 and led the Stars to a second straight championship. The team had relocated to Baltimore because of stadium scheduling conflicts, but the players continued to live and practice in the Philadelphia area. In effect, they played all 18 games on the road. The Stars beat the Oakland Invaders in the title game 28–24. In 1986, Mora was hired to coach the New Orleans Saints. He signed Sam to a contract and made him the leader of his defensive unit. In 1987, the Saints enjoyed their first winning season and Sam made his first of four trips to the Pro Bowl. New Orleans continued to field strong teams right into the early 1990s, and the heart of the team was its linebacking corps, aka The Dome Patrol. 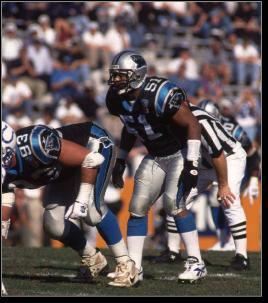 Sam played alongside Rickey Jackson, Vaughan Johnson and Pat Swilling to form one of the best units in pro football history. At age 35, Sam seemed to be nearing the end of his career when the Saints decided not to re-sign him following the 1994 season. A young expansion club, the Carolina Panthers, inked him to a free agent contract hoping he could provide some leadership. Sam obliged, winning the franchise’s first game in 1995 with an interception against the Jets, and being picked for his fifth Pro Bowl in 1996. That year, Sam and the Panthers stunned the experts by winning 12 times and going all the way to the NFC Championship game in just their second season. He also set a record as the oldest NFL player to return a fumble for a touchdown. Sam coached for Carolina again in 2004, but finally lost his battle the following spring. he died on April 18, 2005 at the age of 45. That fall, the Panthers made Sam’s #51 the first retired number in team history. Four years later, he was inducted into the College Football Hall of Fame. His son, Sam III—who joined the Panthers coaching staff in 2006—accepted the award. In 2012, the Panthers wore jerseys with the words Keep Pounding on the inside of their collars.